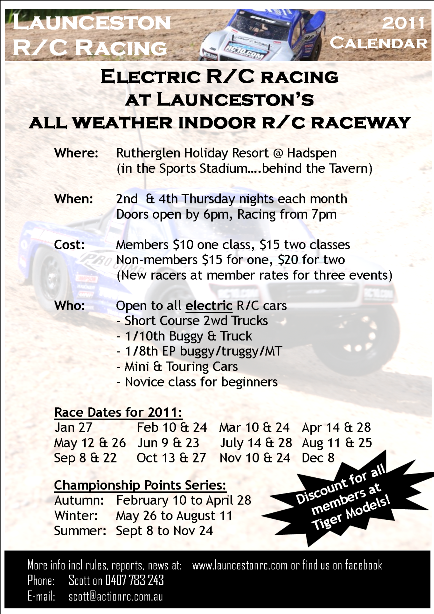 Here’s our 2011 club racing calendar……and read on below for more important dates for your diary…. Please Note: Commencing May 2011, lap counting at Launceston R/C will use the MyLaps RC transponder counting system. This means you’ll need a MyLaps RC4 transponder (or other compatible personal transponder) in order to have lap scoring. The club have some transponders on a rental basis (first-in, first-served). We can arrange purchase of RC4 transponders, or you can source from hobby stores.